Not much change in the weather for the next 5 days. 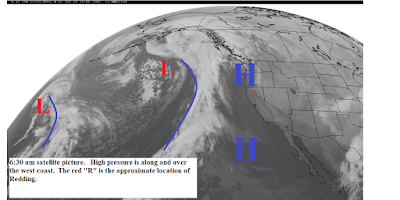 The high pressure ridge will remain over and along the west coast. We will have mostly clear skies with above normal temperatures and relatively light winds. The models shows the ridge weakening this weekend (see map below). The pattern shown on that map would not be a really wet pattern but could bring showers to the north end of the state early next week. Longer range models show the jetstream sinking further south later next week.